If there is one piece of gear that will keep first timers from sticking with the sport, it’s an uncomfortable ski boot. A cheap boot can pinch and freeze toes turning potential fun into complete misery. Thankfully, there are quality options even in the entry-level market. Part of the reason is that most beginner boots are based on more expensive models but with a roomier fit and a softer forward flex. Our top picks for the 2018-2019 season cover boots for true beginners up to progressing intermediates that require greater stiffness and performance. For more information, see our comparison table and buying advice below the picks. And to complete your ski gear set-up, see our article on the best skis for beginners. What we like: Comfortable and enough performance for a beginner. What we don’t: Wide last isn’t great for narrow feet. 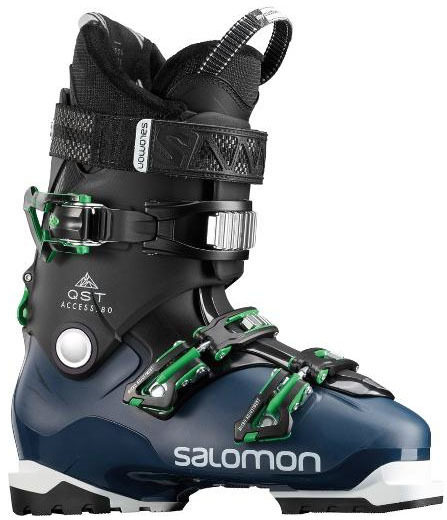 Beginning skiers look for comfort, ease of use, and warmth for their first pair of boots, and the Salomon QST Access 80 provides all of those in spades. Coming from one of the most respected brands in the business, this model has been a popular choice for years, and at a medium soft flex, it’s a boot you can keep as you move up to an intermediate level. The included liner with the QST Access is the coziest on this list among the budget picks, made with an impressive wool hybrid that has metal weaved in for great warmth without the bulk. We also appreciate the inclusion of a soft flexing plastic that sits over the instep of the foot for easy entry and exit. What are the downsides of the QST Access? The wide chassis is limiting to those with narrow feet and doesn’t offer the performance fit of some of the more expensive options below. Furthermore, we think fast learners should invest in a boot with a stiffer flex (Salomon does offer the QST Access in a 90 flex for men and an 80 flex for women). Otherwise, we think the QST Access is a great value and a fantastic starter boot. What we like: Fit technology from boots costing hundreds more. What we don’t: Lower quality liner. If you’re in the market for a beginner boot that you can grow with, the Dalbello Panterra MX 80 is another nice choice. The boot has a medium flex that makes it relatively easy to get over the front of your skis, but is firm enough to handle tougher terrain as you improve and explore more of the mountain. 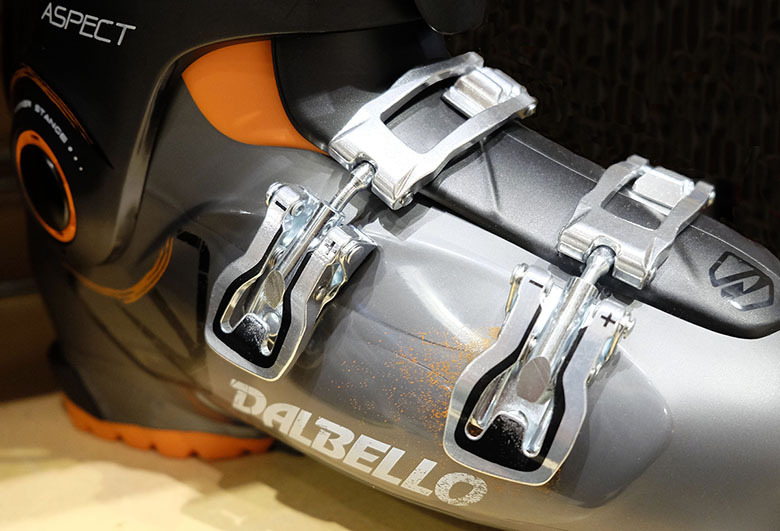 Additionally, you get Dalbello’s premium customized fit, which helps take some of the pain out of fitting a boot. Dubbed Contour 4 Technology, the liner in the MX 80 is given a little extra breathing space between liner and shell around the toes, heel, and bend in the foot and ankle. The result for most folks with normal-sized feet is a good fit that doesn’t pinch at the usual pain points. The rest of the boot is very basic and we'd prefer higher qualtiy liner and buckles, but with the fit of a premium boot and a forgiving and smooth flex, the Panterra 80 is a nice bargain. What we like: Heat moldable liner at a budget price. What we don’t: Super soft flex is only for true beginners. If your perfect day of skiing involves casual sweeping turns and plenty of time socializing, the Nordica Cruise 60 is a great pairing. With a very soft flex and surprisingly comfortable liner, the Cruise is our top cheap boot. What sticks out at this price point is the heat moldable liner, which helps expedite the break-in process, along with all aluminum buckles—both upgrades you'll see in a higher-end boot. The Cruise's classic four-buckle design is unexpected given the very soft flex—most manufacturers opt for 2 or 3 for simplicity and ease of entry and exit—but it does allow for micro adjustments to the fit. Overall, the Cruise is just as advertised: soft, roomy, and very comfortable. It’s all the beginning or casual skier needs. What we like: Lange quality and a lower volume fit. What we don’t: Too stiff for the average beginner. Typically, we wouldn’t recommend a boot with a 90 flex rating for a beginner, but not all first-timers progress in a slow and steady manner. If you think you’ll be carving on your edges in short order, then the SX 90 is where we’ll lead you. 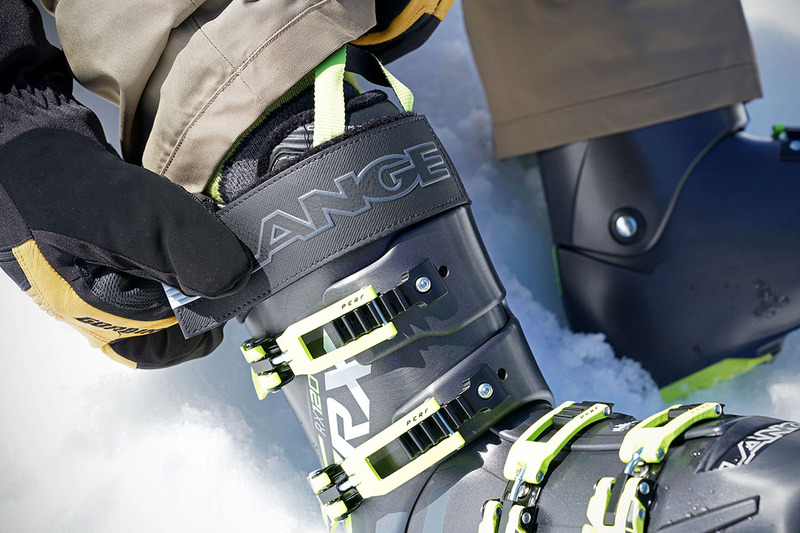 Lange doesn’t dabble much with introductory models—this is their softest flexing on-piste boot—and as such, you don’t see the typical entry-level features. 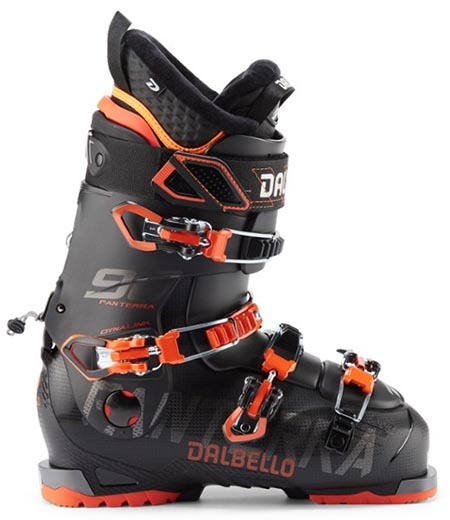 The stiffer mono injected shell combined with four strong buckles and a power strap are a far cry from the other boots on this list, and add up to high levels of power transmission. 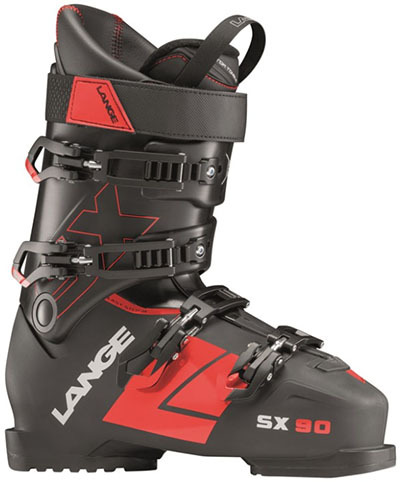 The extra stiffnes may be intimidating coming from soft rental boots, but we think advanced beginners and intermediates will find the SX 90 to be a good pairing. We would prefer a walk/hike mode, but at $300 with this amount of responsiveness, that might be getting a little greedy. If you like the SX’s design but need a narrower fit, Lange’s RX line trims the last width from 102 to 100 millimeters. What we like: A nice option for ambitious beginners. What we don’t: Big investment for those just starting out. 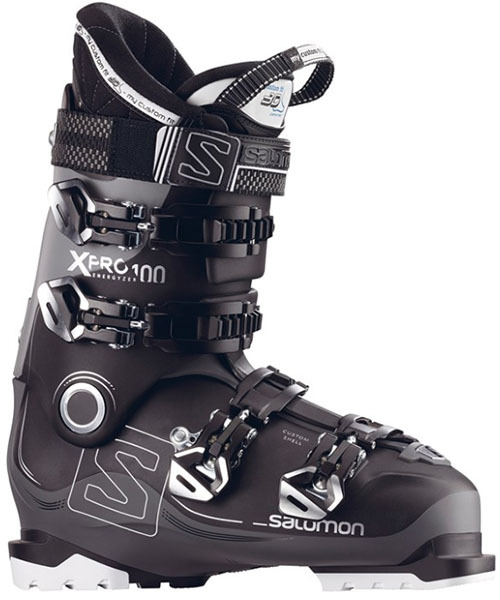 Stepping up in strength and comfort is the über-popular Salomon X Pro 100. It’s one of the best-selling ski boots year after year—and for good reason—thanks to its medium-width last, mid-range stiffness, and premium liner that resonate with the average skier. All-around performance is excellent with a smooth flex that works well for both lightweight and powerful skiers, and the build quality is exactly what we expect from the venerable French brand. Moreover, for dialing in fit, the X Pro is a standout with its heat-moldable liner and shell. The X Pro’s increased flex over the Lange SX above and plush liner pushes the price to a hefty $500, which is a significant investment for a beginner. As with the Lange, this is not the boot we’d recommend for those still debating whether they want to stick with the sport. But with one of the most foot-friendly designs on the market, as well as the performance and durability to last you for many years, the extra cost may be worth it. What we like: Decent flex at a value price. What we don’t: Pretty basic liner. The Rossignol Evo 70 is the entry-level offering from the respected ski brand, featuring their softest flex, widest last, and cheapest price. The setup mirrors most other beginner boots in specs, but nearly all of the extras have been stripped away. You don’t get a heat moldable liner (not a huge loss) or ski/walk mode, but Rossi got the basics right with a smooth flex, nicely shaped shell, and easy to use aluminum buckles and power strap. Sharing a $200 retail price with the slightly softer Nordica Cruise 60 above, the Evo is a great deal for those that will benefit from the added support you get with a 70 flex rating. We think it’s a great match for a lightweight advancing beginner—perhaps a teenager that hasn’t hit that major growth spurt. However, the PU liner is pretty basic, which knocks it down a few spots in our rankings. What we like: Good value for a solid all-around boot. What we don’t: Somewhat unproven design. Nordica’s Cruise above provides all the comfort and easygoing support than many first-timers look for, but their Speedmachine 100 is the better long-term investment. For another $150, you get a boot with a performance-oriented fit, superior power transmission, and heat moldable liner, shell, and hardware. The true beginner may want to stay in their rentals a little longer before taking the leap to the Speedmachine, but its moderately stiff build gives you a lot of confidence at speed. With 100mm lasts, 100 flex ratings, and customizable shells, the Speedmachine and Salomon X Pro are logical competitors. 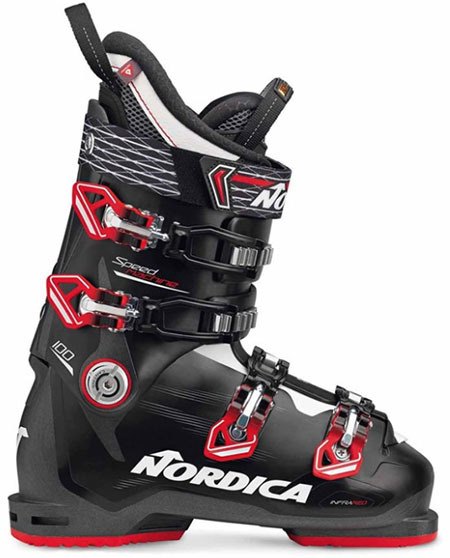 The Nordica has a cost advantage of $100, but the Salomon’s longer track record (the current Speedmachine was new last season) and upgraded liner win out here. With a little more time on the market, however, the Speedmachine 100 could very well work its way up our rankings. What we like: Predictable flex and a wide fit. What we don’t: Middling overall performance. 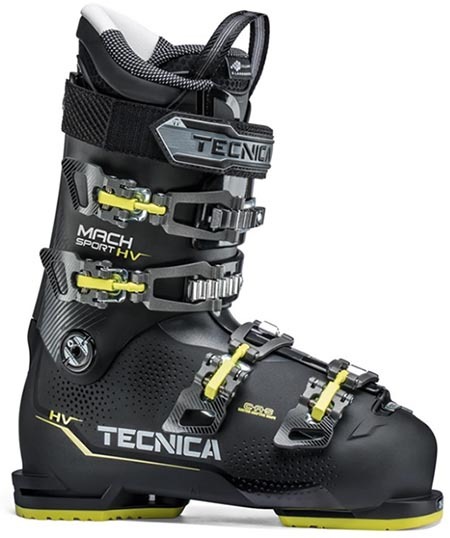 With a stiffer 90 flex rating, the Tecnica Mach Sport HV is a boot that can serve skiers ranging from beginner to intermediate. Functionally, the four-buckle design is easy to use and Tecnica aided the chore of getting a proper fit with an anatomical shell (it still can't beat going through the fit process at a ski shop, however). On the slopes, the boot has a natural flex, which is something you’ll appreciate while connecting turns, but it's not as responsive as the Lange SX or Salomon X Pro above. Tecnica's line-up includes both the high-volume Mach Sport here as well as a high volume last (HVL) Ten.2 model. At 106-millimeters, it's the widest on the market and a great choice for those that need the maximum amount of space around the forefoot. Most riders, however, will be just fine with the 103-millimeter wide Mach Sport. What we like: Good price for an all-mountain design. What we don’t: Most beginners don’t need the sidecountry features. 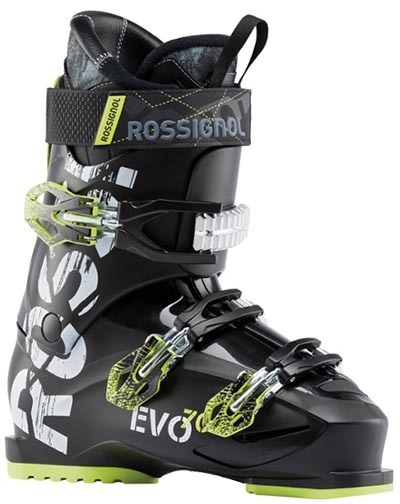 In contrast to Rossignol’s simple Evo above, the Alltrack 90 is a feature-rich all-mountain boot. Sitting at the bottom of the Alltrack line that reaches as far as a $700 Pro model, the “90” retains most of the good stuff at half the price. Among the beginner-friendly options on the market, it’s our favorite for sidecountry use. The hike mode and compatibility with WTR (Walk to Ride) soles work well for quick treks off trail. And on the downhill, the smooth medium flex and strong four-buckle design give you confidence to lean into a turn. The 90 flex rating makes it a solid option for advancing beginners, but the Alltrack falls mid-pack on our list for a couple reasons. First, most beginners don’t want or need the hiking features, and we think the Lange SX 90 is more comfortable overall (and saves you $50). And the Salomon X Pro has a better liner and more precise fit. But the Alltrack 90 can be a great all-arounder for those skiing at resorts with easy off-piste access. What we like: Old school looks and easy entry/exit. What we don’t: Step down in material quality at the price. 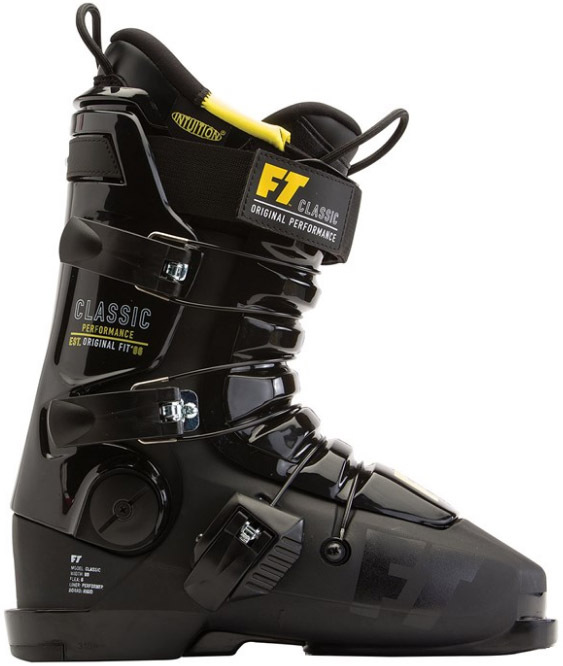 Full Tilt is best known for their freestyle boots that are popular among park riders, but their appropriately named Classic is an all-mountain favorite. The basic design stretches back three decades with its 3-piece shell, which offers a supremely smooth flex and super wide opening for very easy entry and exit. Full Tilt doesn’t use a standard stiffness rating, but the 6 out of 10 equates to about a 90 flex, which makes the Classic among the stiffest options on this beginner boot list. Considering the rigid construction and somewhat dated design, the Classic falls toward the bottom of our rankings. Among the 100+ flex competition, the Pinnacle, X Pro, and Speedmachine all include nicer liners and more reliable aluminum buckle systems. But if you like the retro looks and the 99mm last fits you well, the Classic is a fun and plenty capable ride. For a softer, more traditional beginner set-up from Full Tilt, check out their 70-flex Descendant 4. What we like: Great out-of-box comfort for an inexpensive boot. What we don’t: Not for narrow feet or small calves. 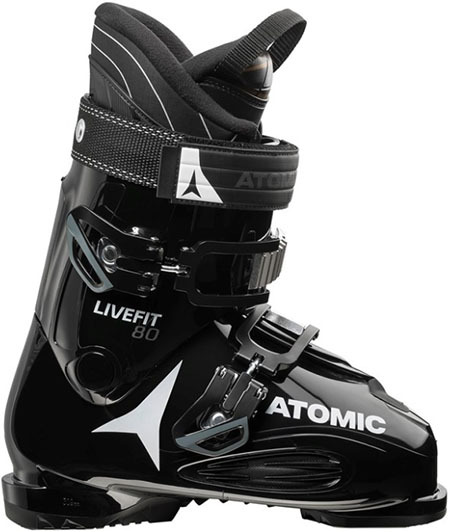 Atomic’s Live Fit 80 is designed with comfort and ease of use in mind. Two large buckles—referred to as megabuckles—make getting in and out a breeze, and their large size lends to simple adjustments even with gloves on. The last width will accommodate medium to wide feet, and accomplishes this using a special stretch panel on the side of boot—technology unique to Atomic. For $250 with a flex rating of 80, the Live Fit is a great deal as a comfortable boot that you can progress with. Our only complaints are that the 2-buckle design is a bit challenging for small fit adjustments and those with narrow feet and smaller calves may be swimming in this liner. In addition, the boot is on the soft side overall and will fall short performance-wise for aggressive beginners. What we like: Adjustable last and quality fit. What we don’t: Not very forgiving for the beginner. With a forward-leaning stance and adjustable fit, the Dalbello Panterra 90 is a performance-minded downhill option. What immediately stands out in the design is the middle buckle that cinches right over the ankle. Traditional boot construction places that buckle further up the leg, but its long reach and central location does a great job of locking the foot into place. For those with a narrow heel, this is a great feature. The fit can be fine-tuned even further with the Panterra’s adjustable last. And unlike the Salomon X Pro 100 above, it doesn’t require a bootfitter—you simply tighten or loosen the buckle that closes over the toes. At the tightest setting, the Panterra has a semi-snug 100-millimeter width (among the narrowest on this list). And at its loosest setting, you get a 102-millimeter last, which is about average for an entry-level model. Overall, we prefer the even more customizable and comfortable Salomon above, but the Panterra gets high marks for ease of use. What we like: Roomy and compatible with tech bindings. What we don’t: Not meant for a downhill-focused beginner. 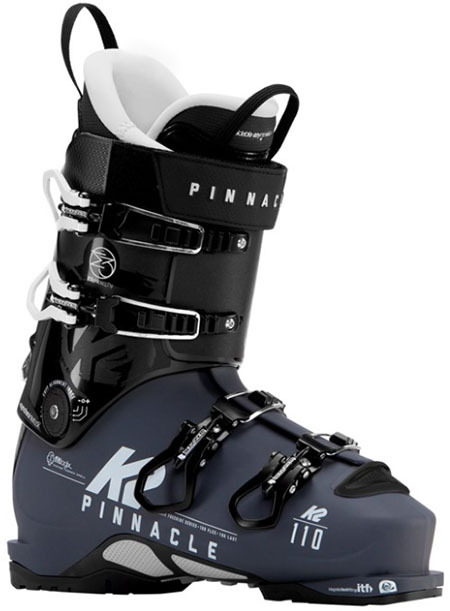 Nearly all beginner skiers stick to lift-assisted runs, but for those planning on hitting the backcountry sooner rather than later, a boot like the K2 Pinnacle 110 is a great choice. Backcountry or alpine touring-style skiing requires a boot and binding combination that releases the heel for uphill travel. And the Pinnacle is the only one on this list that’s compatible with “tech” backcountry bindings. And at $500, it’s (surprisingly) among the most affordable alpine touring boots on the market. What gets the Pinnacle 110 a spot on our list is a build that’s surprisingly friendly to the beginning skier. This version has their medium volume 100-millimeter last, and the 110 flex is as soft as it gets for an alpine touring boot. If you don’t plan to get a touring setup, steer clear, but we think it’s the best “entry-level” backcountry boot on the market. What is a Beginner Ski Boot? While there isn’t a comprehensive definition in the market of a beginner boot, it’s pretty easy to piece together a number of common characteristics. To start, these boots are more value-oriented (but good ones aren’t the cheapest around), packing fewer features and a more basic liner than high-end options. They also offer the most flex and the roomiest fit, unlike performance boots which are stiff and low volume to help transmit as much power as possible to the skis. Given their more generous fit, they’re also the most comfortable to slide into and are the least likely to cause foot or shin pain after a day on the slopes. The limited performance potential of a beginner boot does mean it's best for the intermediate or advancing skier to avoid them altogether. 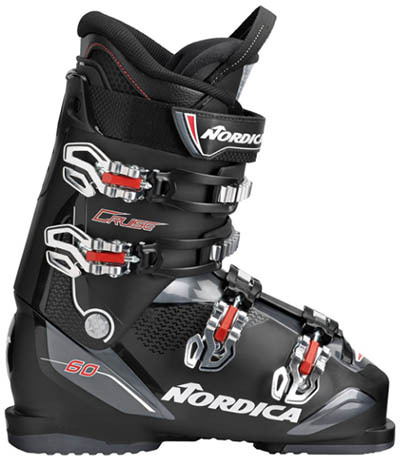 Those skiers should instead read our article on the best downhill ski boots. Because of the focus on the beginning skier, the best terrain for these boots is cruising your green circle or blue square runs at the resort. The boots on this list are often the detuned and softer version of dedicated downhill boots, and this is reflected in their performance. Steep and technical terrain requires fast inputs and changes of direction—both things that a soft and flexible boot will not provide. As a result, boots like our top-rated Salomon QST Access 80 perform best on groomed runs and at a more subdued pace. 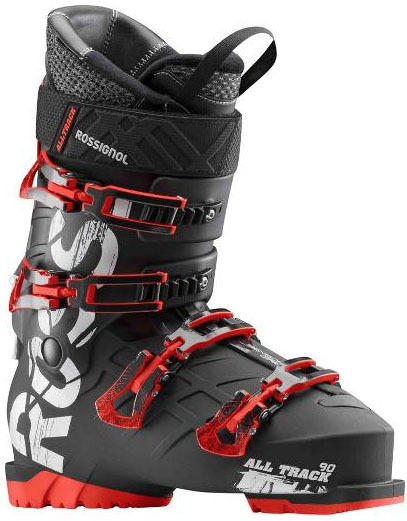 Stepping up to a boot like the Rossignol Alltrack 90 gets you more all-mountain versatility and stiffness. In many ways, a beginner boot is defined by its flex rating. Every downhill boot on the market is given a flex index number ranging from approximately 60 to 130. Lower numbers are softer, have more give, and are more comfortable, making them ideal for beginner skiers. Moving up in stiffness to intermediate and advanced models gets you a boot that isn't as cushy but more efficiently transfers your inputs to the bindings and skis. Determining whether or not you want to upgrade to a high-end boot right off the bat is one of the considerations you need to make. Are you anticipating advancing quickly? If so, it may be worth getting a boot like the Lange SX 90 as opposed to purchasing new boots after only a season of use. A preferred stiffness also correlates with your body weight, which is why women’s boots have a lower flex rating relative to performance. Below are general recommendations; there are ranges within ranges that we dig into later. Within the beginner category, there can be a further breakdown of what’s considered a “true beginner” with a super soft flex. This falls into the 60 to 70 flex range for men and 50 to 60 for women. 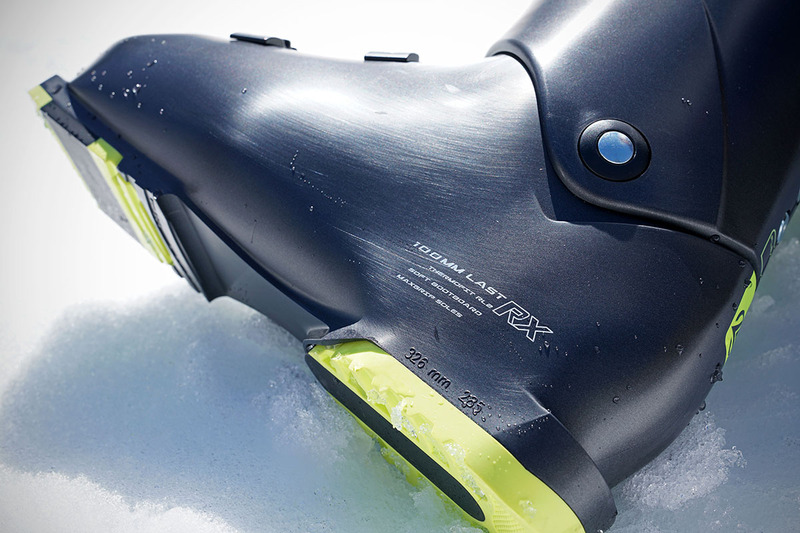 Lightweight skiers desiring the cushiest setup should find a suitable boot here. Heavier skiers will be better suited opting for a boot that is more substantial for improved support. Something with a flex of 70 to 80 for men and 60 to 70 for women is a great starting point. This second category is also suitable for lighter weight advancing beginners or intermediates. After the flex rating, the most common specification listed for ski boots is last. This measurement is based on the width of the forefoot and listed in millimeters. 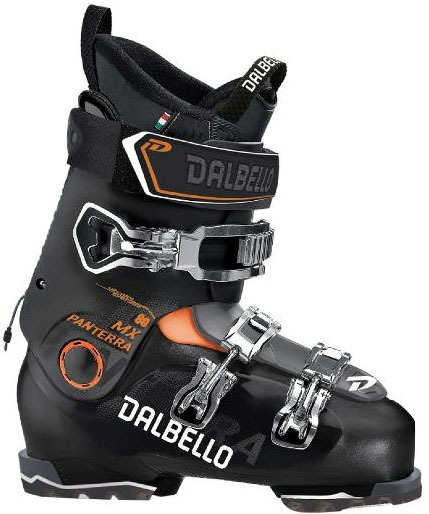 Most manufacturers make ski boots with varying lasts to accommodate those with narrow, average and wide feet. Additionally, the last is an indicator of performance, as a lower volume fit serves as a responsive conduit between you and your skis. On the casual end, boots are going to fall in an average to wide width, which should fit all but the narrowest feet just fine. Most beginner ski boots are made up of two independent pieces: a hard plastic outer shell that provides structure and strength and a removable liner that delivers comfort, support and insulation. The liner is filled with varying amounts of foam, depending on the type of skiing the boot is intended for. Within the entry-level category, these liners are going to put a premium on cushion rather than performance, so they will have a soft and inviting feel. Intermediate and advanced models will be firmer, which brings the added benefit of improved energy transfer to your skis. The liner should be comfortable but reasonably tight around your foot. Your liner will conform to your feet, so don’t be too concerned if it feels snug at first, however, you’ll need to size up if your toes are pressing against the hard-sided shell. Heat-moldable liners are found on a number of our favorite beginner boots, including Salomon's X Pro, and can be custom fit to your feet in a ski shop that has the necessary equipment. This is a nice way to get the liner to fit your feet right out of the box, but isn’t mandatory for most folks. You can get much of the same fitting accomplished just by wearing the liners around the house or in a few early season ski days. To start, it’s helpful to know that there aren’t a lot of revolutionary buckle and strap designs in the beginner to intermediate category. The biggest differences you’ll see are the number of buckles used. Some use the classic 4 piece, which offers improved adjustability but are a bit more of a pain to get on and off. Others opt for 2 or 3 buckles for greater simplicity. Either option can work well for a beginner and we’ve had success with both designs. We always recommend looking for buckles made mostly with aluminum for greater durability (plastic is cheaper but more prone to breaking). The strap at the top of the boot near the cuff is another important piece of the design. Sometimes referred to as the power strap, it keeps that top portion nicely locked into place to help bring out the full performance potential of your boots—and at a lower weight and more comfort than adding another buckle. Having a full compliment of buckles as well as a quality power strap also helps in really dialing in the fit, which can make accommodating varying sizes of legs and calves that much easier. A proper ski system is just that: a system that has all pieces working in concert. This is just as important for a hard-charging expert as it is for a beginner. As such, it’s best to pair your softer flexing boots with binding and skis that are equally as forgiving. Entry-level skis and bindings often come as a single, integrated system, and we break down the best options in our best skis for beginners article.